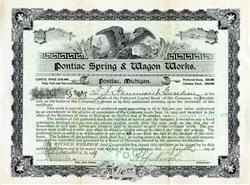 Beautifully engraved RARE historic certificate from the Pontiac Spring & Wagon Works dated 1903. This historic document has an ornate border around it with a vignette of an eagle. This item has the signatures of the Company’s President ( Albert North ) and Secretary ( Harry Hamilton ) and is over 114 years old. PONTIAC — Pontiac, Michigan — (1907-1908) — The Pontiac Spring and	Wagon Works was incorporated in July of 1899 by Albert G. North and Harry	G. Hamilton. By 1905 they had taken over the manufacturing of the Rapid Truck (from the Rapid Motor Vehicle Co.)	that had been introduced by Max Grabowsky in Detroit two years earlier. And in 1907 they decided to produce an automobile, too. Pontiac Spring & Wagon Works made the first Pontiac Car every built. It was introduced that fall, and was a highwheeler weighing 1,000 pounds	and powered by a two-cylinder water-cooled 12 hp engine. The prototype	was displayed in October at an exhibition sponsored by the Carriage Dealers'	Association in New York City's Grand Central Palace. In December several	of the new Pontiacs were exhibited at the Chicago Automobile Show. Well	received by the press, the car featured final drive by double chain and a	friction transmission. The wheelbase was 70 inches, front wheels 38, with	4Os in the rear, and solid tires all-around. The first deliveries were probably	made in early 1908, but after about 30 to 40 units were dispatched to new	owners, "The Car That's Built to Get There," as the slogan put it, went no	Co further. In January 1909, General Motors Corp. President, William C. Durant, purchased a 50% interest in the Oakland Motor Car Company. Later that year GM, bought out the other 50% after the unexpected death of Walter M. Murphy at the age of 45. Also in 1909, GM also purchased the Rapid Motor Vehicle Co. This was the beginning of the General Motors Company.